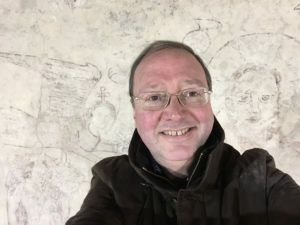 Fund-raising has its occasional advantages – it’s not often you get to roam the rafters in St Leonard’s church and find yourself in company like this! From the temporary scaffold I had a privileged chance to see the wall paintings close up. They are incredible – and really convey a sense of history. I love the slightly quirky expression on the faces of the angels – the one on the left looks rather serious as he swings his censor. The experts tell us that this part of the wall painting dates from some time before 1350. Another fascinating detail – on the cross-beam above the painting shown above are tiny stars. Again, this wooden beam would have been decorated, and all that remains now is the faint impression of those stars. 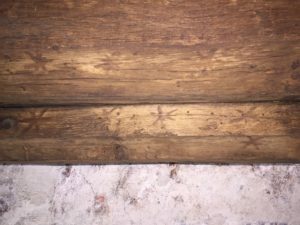 From our scaffold platform it’s a sobering thought that this is possibly the first time anyone has noticed these for hundreds of years. The last major restoration of the roof took place in 1791 – and there’s an inscription to prove it. Since then, only the deathwatch beetles have had a close-up look! Thanks to those very beetles, the ridge timber running along the spine of the Nave roof has been eaten away from above. We have now installed some temporary supports as shown in the photo. These support the spine and help carry the weight down onto the solid cross-beams. From the ground it’s difficult to see how the roof structure works to bear the load not just of the timber boards but the outer copper roof as well. The Structural Engineers have now got a good feel for what is sound and what is not. This temporary support ensures that the ends of the “purlins” are firmly held in place. 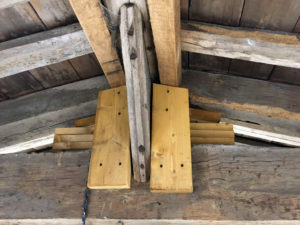 The purlins were added to provide support for the ends of the rafters which have been nibbled away by the beetle larvae. 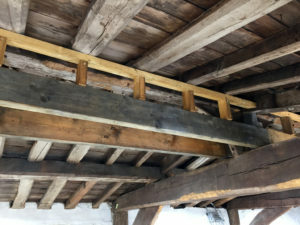 You can also see how “chocks” have been built up, again as temporary supports, to make sure that the weight of the structure rests firmly on the massive cross-beams. They also stop the spine from sagging down, which would cause the roof to spread and become unstable. These temporary supports are designed to ensure the roof remains structurally safe for the time it will take us to raise the £1m or more needed to make the repairs permanent. Using the scaffold platform, we have been able to assess how much of the timber is affected by rot and beetle, and where the problems are. This in turn enables the quantity surveyor to assess more accurately the likely costs of repair, and the architects and structural experts to produce detailed specifications of what needs to be done. Now we have to focus on raising the money…! Absolutely amazing English history, that just has to be preserved. Site design by UKChurches Copyright (c) 2019, content by Flamstead Heritage group. All Rights Reserved.